50 GIANT TRIPLE WIDE BRACELETS - includes 30 triple wide assorted color bracelets plus 30 connectors, all carefully packed into our iconic Lumistick blue tube.8-12 HOURS OF GLOW - Our glowstick bracelets work for as much as 12 hours after activation, making them perfect for music festivals, New Year's Eve, or any other celebration stretching late into the night.VERSATILE flexible 8" glow sticks can made into braclets, linked together to make necklaces, looped together for festive garlands and chains, and so much more!THREE TIMES THE GLOW - these big, bright, triple wide glow stick bracelets are brighter and more colorful than anything else out there.SAFE, NON-TOXIC glowing party favors are suitable for ages 3 and up. Lumistick glow products are completely non-toxic, non-radioactive, and non-flammable.The best brand of glowstick bracelets on the market just got three times better. 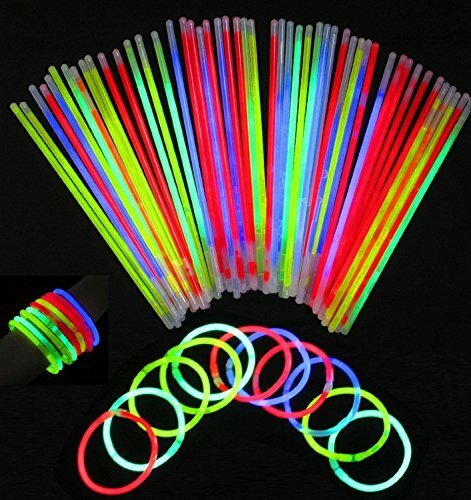 Your order will contain 30 of our new and improved triple-wide 8" glow stick bracelets in a wide assortment of fun neon colors, plus 30 connectors. Lumistick brand glow stick products come fresh from the factory and were manufactured just weeks ago, so you know you are getting reliable glow every time. 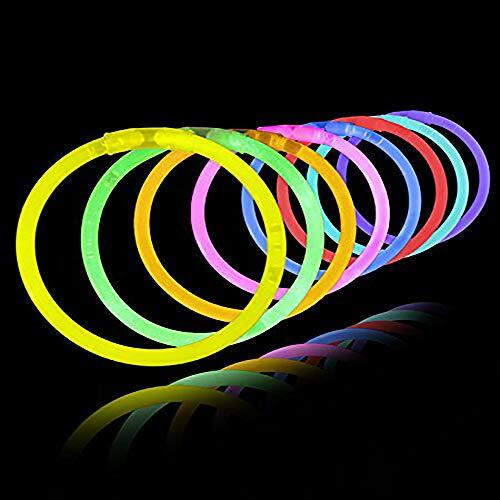 These glowstick bracelets are perfect for festivals, birthdays, Halloween, 4th of July, New Year's Eve, and any other occassion you can imagine. Got leftovers? Lumistick glow products have a shelf life of 2 years, so even if you don't use them all they can be saved for future fun. Lumistick brand glow sticks are non-toxic, non-flammable, and non-radioactive. They almost never break open, but if they do the chemicals inside can be washed off of skin and clothes with ordinary soap or detergent. 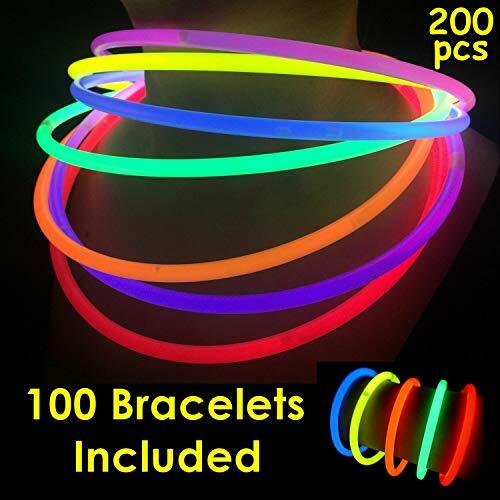 Glow Bracelets - 15 per pack - 8 inch plastic glow in the dark bracelets with connectors. Bend and shake to activate. Note: Do NOT bend these until ready to use. 5 of each color: green, blue and pink. Remove both plastic caps on tube before assembling to find connectors. 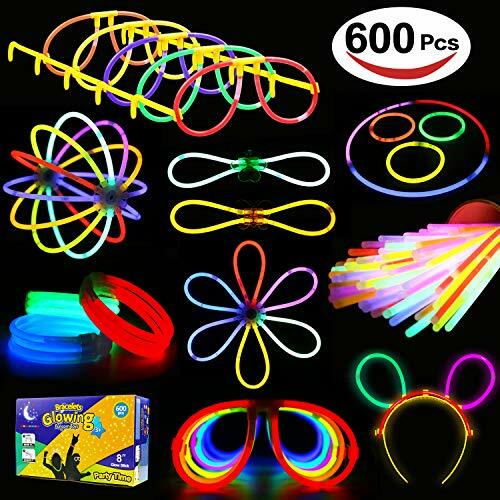 116 PIECE GLOW PARTY FAVORS includes 100 8" bracelets plus 100 standard bracelet connectors, in addition to 8 double bracelet connectors, 2 fidget spinners, 2 mini clapper hands, 2 lollipop spinners, and 2 sets of glasses connectors.MORE THAN JUST GLOW - Our included popular toys and connectors add a fun neon twist to any event and are sure to be a huge hit!8-12 HOUR LUMINESCENCE is ideal for music festivals. These cool glow sticks illuminate revelers from the opening act to the headliner’s final bow. Lumistick Glow Sticks have an unparalleled 2-year shelf life.VERSATILE glow-in-the-dark party favors brighten any celebration. Loop bracelets and necklaces together for a festive garland. 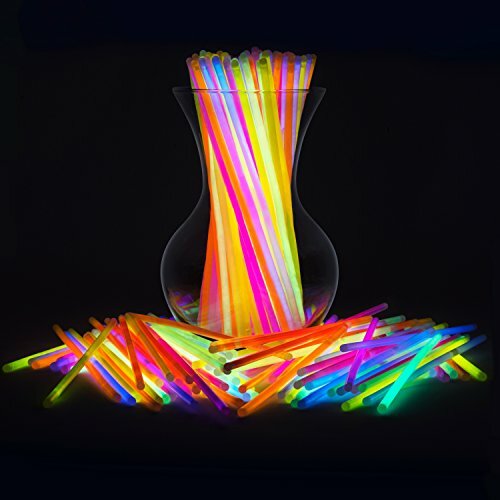 Insert glow sticks into helium-filled balloons for unique mobile lighting.SAFE, NON-TOXIC glowing party favors are suitable for ages 3 and up. 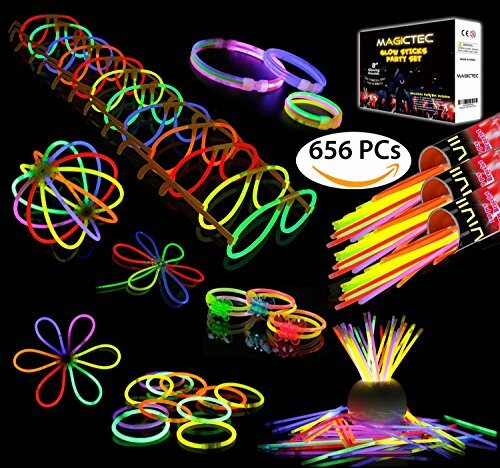 Glowing party favors will light up guests’ faces at birthday or Halloween parties, music festivals and Fourth of July celebrations.Dress up your Glowstick Bracelets with this collection of exciting Lumistick toys and connectors! Each order includes 8 over-sized double bracelet connectors shaped like stars, hearts, flowers, and butterflies; 2 fidget spinners, 2 clapper hands, 2 mesmerizing lollipop spinners, and 2 sets of round eyeglass connectors. Everything is more fun in the dark! Regardless of the time of year, Lumistick Glow Light Party Favors will be the hit of your next event. Use our glow sticks to create colorful luminaries for your walkway on Halloween. Thread some jingle bells onto our bracelets for extra yuletide cheer. Make a ring-toss game more challenging after the sun goes down. Don our eye glasses for a fun and funky look at school dances or church lock-in activities. 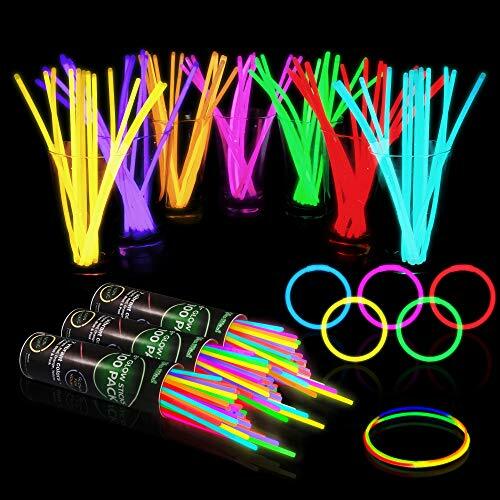 Lumistick Glow Sticks Party Favors Set make colorful, lasting memories at any celebration. 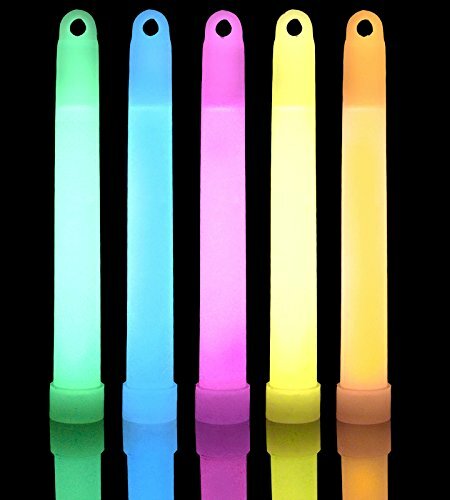 Non-toxic and non-combustible, Lumistick Glow Light Party Favors are great fun for anyone age 3 years and older. They come in many vibrant colors that glow brightly for up to 12 hours so they provide long-lasting fun on autumn hayrides, at concerts or as unique party decorations on New Year's Eve. All are factory-fresh and boast a 2-year shelf life. Let your imagination run wild - don't be content with just bracelets, necklaces, glasses and sticks. Use the included connectors to link several pieces together as a glow-in-the-dark jump rope. Lumistick Glow Party Favors breathe new life - and light - into family fun night!